Because an asparagus bed can last for decades, it is crucial to plant the best cultivar. “Best” is a word that here encompasses flavor, productivity, and hardiness. 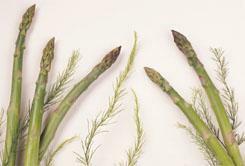 It has long been recognized that asparagus productivity is superior from hybrid all-male varieties (the hybrid aspect is not troublesome to us because the vegetable is a long-lived perennial). Modern asparagus types reportedly have uniformly good flavor quality, so our choice comes down to hardiness. Given all that, the hybrid all-male “Jersey” types are the obvious choice—productive, and well suited to really cold-winter climates. The folks at Jersey Asparagus Farms—consider the name—given our climate data, confirmed our guess that Jersey Giant is the optimal variety for here. (For some reason, many home-garden seed catalogues list instead Jersey Knight, a less-suitable variety for most locales.) A 1997 study by the University of Oregon, done in a climate zone similar to ours, supports Jersey Giant as the most desireable type for this region, in terms both of productivity and disease resistance (a variety not available to home gardeners, Del Monte 361, produced a little more, but was not as disease-resistant as the all-male Jersey types). Other trials have further confirmed Jersey Giant as the best available cultivar. Oh yes: crowns, of course—starting from seed just takes too long. We put in 50 crowns, which mostly succeeded; they are now into full production (see “Growing”, below), and we are well pleased with the results. Though asparagus can be grown from seed, one loses at least a year that way. The more common procedure of buying “crowns”—preferably from asparagus specialists—works best. First, though, here is a summary presentation of asparagus planting techniques from the aforementioned Jersey Asparagus Farms web site (they have now gone wholly commercial and closed their former web site; this is an archived copy). Mind, where they speak of 5-10-10 fertilizer, the organic (or near-organic) gardener will have other ideas. Asparagus crowns should be planted out “in the early spring.” The spectrum is late March to late April, and—this being a one-time task—the best thing to do is to talk with your selected source of crowns and get their advice on an exact date (they need to know anyway, to know when exactly to ship the crowns to you). Have as detailed a set of weather records as you can get for your locale ready to hand when you speak to that supplier. It is imperative to have the future asparagus bed as free as you can get it of all weeds, especially perennials; that means advance effort. In the fall preceding the spring in which you intend to plant, go over the bed area again and again, removing any weeds whatever that poke their ugly heads up. Asparagus roots are very complex webs that extend for many feet horizontally but are in the main not very deep—one must keep weed roots from getting caught up in the tangled mat or the weeds will be there as long as the asparagus is, competing with it for resources. If you use deep-bed methods to prepare your future asparagus bed, you will get better results and will be able to space the plants a little more closely. It pays to check not only the soil pH but also its key nutrients: phosphorus, potassium, and above all nitrogen, for asparagus is a heavy feeder. (The John Jeavons book we recommend elsewhere has excellent and quantitatively exact instructions for how to remediate soil deficient in any of those nutrients.) You should test all your soils at least annually anyway—and, if you remediate as a consequence, wait a bit and check again to see that it all came out right. It also pays, if you have—as is common here—heavy, clay soil to put some effort into lightening it; humus is the organic gardener’s preferred method, but even mixing some sand in (mixing well) will work. Asparagus does not do well on heavy clay, and—again—this is decades’ worth of plant you’re preparing for. Asparagus tolerates high soil pH values, but not low ones; the ideal is something right around 7.0. If you are planting multiple parallel rows of asparagus, space the rows 4½ to 5 feet apart; space the outermost rows (or the only row if you are not planting multiple rows) a minimum of 3 feet from any other vegetable planting. Be sure to keep asparagus well-watered, especially in the first year or three. Asparagus is said to benefit immensely from heavy mulching, which keeps in the soil moisture and also keeps down weed incursion. If you can get it, dried seaweed is excellent (asparagus tolerates salt well, and some feel a little actually benefits the plants—it evolved as a seaside plant), for it will both mulch and, as it decays, nourish. Do not use any non-acidic organic substance as a mulch—avoid pine needles or oak leaf-mold or the like; if you use anything hard to chemically break down, such as sawdust, mix some high-nitrogen fertilizing material in with it. As we said, asparagus is shallow-rooted: cultivate thoroughly, but carefully and shallowly or you’ll damage that extensive root network. And remember that that network extends for many feet around each plant, so keep the area for perhaps five feet each side of each row well cleared of weeds, and try to walk on it as little as possible—or not at all (put a thin board down as a “gangplank” for access). An annual springtime application of good fertilizer, raked lightly into the ground all upand down the row or rows, is needed. A second, mid-summer side dressing with a high-nitrogen fertilizer is wise—as we said, they’re heavy feeders. In the autumn, some cut the remaining plants down to ground level, but others prefer to just let the plants die back naturally; we think the latter best. To repeat what one reads again and again: do not try to cut any spears the first year—even if you get some vigorous-looking ones. This is a long-term proposition: accomodate the plants and give them a chance to develop. (Some even say to withhold cutting till the third year after setting out the crowns!) When you finally do get to harvest, cut the wanted stalks just below the soil surface (there are special knives made for harvesting asparagus spears, but they are scarcely mandatory). Try not to cut above ground, but definitely do not cut deep or you will damage the crown. Asparagus is a perennial member of the Alliaceae family, the alliums (till recently called the Lilliaecae family), which also includes onions, leeks, and garlic. No one seems quite sure where asparagus originated. Some believe it derived from a wild plant that grew thousands of years ago in sandy soil across northern Europe and in Britain, though asparagus is depicted in ancient Egyptian writings and has also been grown in Syria for more than two millennia. The name asparagus comes from the Greek word asparagos, meaning sprout or shoot, which word first appears in English print around 1000 A.D. The Greeks and the Romans prized asparagus (Julius Caesar, Pliny, and Augustus all praised it, and Cato gave excellent growing instructions for it), both for its culinary value and for its alleged medicinal qualities—they believed asparagus could cure toothaches and prevent bee stings. They ate it fresh in season, and dried it for winter use. Cultivation, and popularity, spread through Europe in the 16th century. Louis XIV of France was so fond of asparagus that he ordered special greenhouses built so he could enjoy it year round. From Europe, early colonists brought it to America; it is said that one Diederik Leertouwer, a Dutch immigrant who arrived in the U.S. in 1784 and settled in Massachusetts, first brought asparagus to the New World. It soon became well-enough known that Thomas Jefferson wrote well of it. Asparagus was first planted in California in the 1850s. Asparagus notoriously generates a distinct and distinctive odor in the urine. The belief that this only happens to some people—presumably owing to genetics and body chemistry—is false; the truth, only discovered in 1980 and still not widely known, is that a certain fraction of the population (this time really owing to genetics) is actually unable to perceive that odor, and so wrongly believes itself free of the effect. Inquiring minds want to know. Cooks should recall that a well-known saying of old Rome for something done very rapidly was ”As quick as cooking asparagus“ (it probably flows better in Latin). It was last modified on Monday, 28 January 2019, at 02:10 EST.